At the Al-Qasemi Conference, Israel, 2011: From left, Stephen Suleyman Schwartz, Khalid Mahmud, Shaykh Abd Al-Rauf Al-Qasemi, Shmuel Moreh, Pehlul Duzenli, Arin Salamah-Qudsi, and others. Baqa al-Gharbiyya, Israel—A high-level academic conference on Sufism, the spiritual tradition in Islam, was held here on May 24-25, and it offered lessons apart from any involving religion. For anyone unacquainted with actual life in Israel – and for academics lured by demagogic calls for a boycott of the Jewish state – the conference might have provided a revelation of often-unspoken truths. 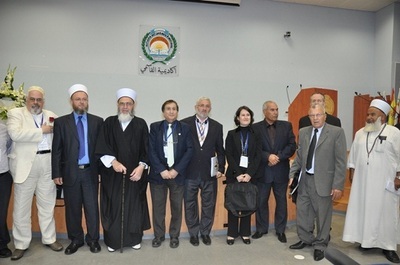 The "First International Conference—In The Footsteps of Sufism: History, Trends and Praxis" was hosted by the Al-Qasemi Academy, an institution that, in the words of an enthusiastic student, "hopes to be the first Muslim university in Israel." Baqa al-Gharbiyya, where it is located, is a town divided by the "green line" between Israel and the West Bank, and the school is on the Israeli side of the frontier. With about 2,000 students, mainly women, it receives 35 percent of its budget from the Israeli Ministry of Education and the rest from private donors. Al-Qasemi (with the accent on the first syllable in "Qasemi") is planning a second campus, to award bachelor's degrees in technology, but has yet to develop a budget for it. Here a digression on Israel's minorities may be in order for anyone surprised that the Israeli authorities would subsidize an Islamic school. Nearly 17 percent of Israel's population is Muslim. Overwhelmingly Arabs, these Israeli citizens number about 1.6 million in a total population of 7.5 million. They carry Israeli passports and have secular educational opportunities equal to those of their Jewish neighbors. Most are bilingual in Arabic and Hebrew. They have enjoyed full voting rights since the Israeli parliament, the Knesset, first met in 1949. It is sometimes pointed out that Israeli Arabs have more political freedom than Arabs anywhere else in the Middle East, with the exception of Iraq since the mid-2000s. The non-Jewish population of Israel also includes Arab Christians (2 percent of the total census) and Druzes (1.7 percent). Israeli Arabs are not required to serve in the Israeli Defense Forces (IDF), though some volunteer for duty as soldiers, and more perform "national service," usually involving tasks like community administration, for which they receive the same salary and benefits as soldiers. Another 170,000 or so Israelis are itinerant Bedouins, who have their own dialect and perceive themselves as victims of discrimination by other Arabs; some of them, too, volunteer for the IDF. Israeli Arabs are employed throughout the civil administrative apparatus. The Druzes, who number around 100,000 (except for 20,000 in the Golan Heights who claim to be Syrians) are required to serve in the IDF. Druzes follow an esoteric faith derived from Shiism, but now consider themselves outside Islam. They are tough mountain people and hardy fighters. The Al-Qasemi complex was founded in 1967 and the school in 1989, with only 40 students, by a Sufi sheikh, Husni al-Din al-Qasemi, and his four sons. The last of these, sheikh Abd al-Rauf al-Qasemi, now serves as its spiritual guide. Its current, large installation is typically crowded with a cross section of Israeli Muslims: clerics of dignified mien; women teachers and students, some wearing the headscarf (hijab), some without (the niqab, or face veil, is nowhere in sight). The school is affiliated with the Khalwati Sufi order, which is so named because its adherents engage in "khalwa" or periodic seclusion from the outside world. Khalwati Sufis are found in all Muslim countries. According to a statement of its vision, the school maintains an Arabic-language program that "seeks to make Arabic compatible with the needs of sciences, literature, and arts … [and] recent developments [in] contemporary culture and modern life." The means to realize this project include publication of a new dictionary of contemporary Arabic, production of an encyclopedia of modern Palestinian literature, and publication of an academic journal, Al-Majma ("Collection"), with articles in Arabic and English. Al-Qasemi's first academic conference on Sufism was remarkable for the range of participants. Jews and Muslims who study and teach in the country's "Jewish" universities—the Hebrew University of Jerusalem (HUJ), Bar-Ilan University, the University of Haifa—were joined by Westerners of Christian background. All the papers presented, to an audience of about 100 each day, were serious and significant. Muslim academics spoke on the history of Khalwati Sufism, the lives and works of notable Sufis, and Arab poetry. Jewish professors, like Shmuel Moreh of HUJ, addressed similar themes. An Iraqi Jew born in 1933, Moreh lectured on an Egyptian Muslim historian, Abd al-Rahman al-Jabarti, who fiercely opposed the Wahhabi fundamentalists who pillaged Arabia and eventually created the Saudi kingdom. Moreh delivered his paper in Arabic, which he described to me as his "mother tongue." Moreh, who is unwavering in his commitment to the Jewish state, told me he writes love poetry in Arabic. He has been invited to return to Iraq but has declined. He clearly enjoyed warm respect from his Arab colleagues. Many of the papers were delivered in English, some in Hebrew, and some in Arabic. Itzchak Weismann, an internationally recognized authority on Sufism and on Syrian Islam, discussed the place of Sufis in "the age of globalization." Weismann, head of the Jewish-Arab Centre at Haifa University, has become an important interlocutor for Israeli Jews on the subject of the Arab Spring—or Muslim Spring, since it includes Iran. Weismann has played a particularly important role in refuting claims by the Syrian government that protests against the tyranny of Bashar al-Assad are driven by Salafis, that is, Saudi-backed Wahhabi fundamentalists. Carl Ernst of the University of North Carolina at Chapel Hill, described his rendition into English of the poetry of Mansour al-Hallaj, the most famous of the Sufi dissenters, who was executed for alleged heresy in Baghdad in 922 CE. Ernst proved to be a strikingly gifted translator. Al-Hallaj, who was purportedly killed for having proclaimed, in an ecstatic state, "I am the truth," using a descriptive of God (al-Haqq), is still debated by Muslims and Western scholars of Islam as hotly as he was in his own time. But to emphasize, the most impressive aspect of the Al-Qasemi conference was that it stood as a reproach to the academics—both Israeli Jews and Westerners—who call for a boycott of Israel and its system of higher learning. "Boycott" is the first term in a malign triangle of measures intended to isolate and ostracize the Jewish state—along with "divestment" and "sanctions." The campaign to delegitimize Israel is nothing new; one may look back at the infamous "Zionism is Racism" resolution maintained by the United Nations from 1975 to 1991. I asked several members of the Al-Qasemi faculty what they thought of the call for an academic boycott of Israel. Arin Salamah-Qudsi, a female professor at the University of Haifa and teacher at Al-Qasemi, who organized and ran the conference with outstanding efficiency, expressed disregard for the project. Calling on foreign academics to boycott Israel would harm Israeli Muslims no less than Israeli Jews and Christians, she said. Why, after all, should Islamic scholars avoid opportunities to meet and cooperate with Muslim clerics, Sufis, and academics inside Israel? The roster of academic affiliations at the conference gave evidence of opportunities available to Arab Muslim scholars in the Israeli system of higher education. Salamah-Qudsi, whose paper described issues of Sufi practice in Baghdad during the 12th and 13th centuries, provided one example. Khalid Abu Ras, who is working toward his doctorate at Bar-Ilan University, lectured on the Islamic conception of "Imitatio Dei," or emulation of God's attributes, using the Latin phrase as well as Arabic terminology. Khalid Sindawi, who teaches at the Jewish-founded Academic College of Emek Yezreel and at Al-Qasemi, described the impact of Sufi beliefs on Shia Islam. In a video conference, Ammar Badawi, the mufti (sharia judge) of Tulkarm on the West Bank, evoked the lyrics of Sheikh Mustafa Al-Bakri Al-Siddiqi, a notable Sufi poet. Daphna Ephrat, of the Open University of Israel, who has written authoritatively on Arab Sufis in the 12th and 13th centuries, presented a paper. I observed to her that there are "two Israels"—the real one in which Jews and Arabs work and live alongside each other day by day, and the nightmarish "apartheid" state conjured up in the propaganda of Israel's enemies. She told me her work on Palestinian Sufism had been denounced in an American academic journal as "Orientalist"—the insult made infamous by the late Edward Said. In 2008, Vehbi Bajrami, an Albanian American journalist of Muslim background, visited Al-Qasemi and wrote in Illyria, the Albanian-language semiweekly he publishes in New York, that the school was conceived by the Sufis as a means of allowing Israeli Muslims to study their religion without going abroad and receiving "ideas that were deemed inappropriate for the community." Bajrami was told by Dalia Fadila, a lecturer in English literature at Al-Qasemi, "It is unfortunate that most of the programs for studying Islam in Muslim academic institutions are driven by dogmatic frameworks of thought that would make sense only centuries ago." Al-Qasemi is nothing like the radical madrassas that proliferate in Muslim lands. With the help of the Israeli authorities, it has become a model Muslim college. It is unique within Israel's borders today, although the country also has a much smaller Arab Christian institution for higher education, Mar Elias College (also known as the Nazareth Academic Institute, NAI), established in 2002 as a branch of the University of Indianapolis, which is affiliated with the United Methodist Church. In 2009 the Israeli government approved the establishment of Mar Elias University, which must subsist on private donations for five years before it qualifies for state funds. Several other Christian academic institutions operate in Israel, but serve students coming to the Holy Land from abroad. During the conference, a number of students asked me, rather shyly, if I thought Sufism could bring peace to the Middle East. I answered honestly that I do not know and hesitate to make predictions. But an institution like Al-Qasemi is certainly preferable to a Wahhabi madrassa or an Iranian-backed Shia seminary of the kind found in Lebanon, to say nothing of the corruption of the Palestinian Authority and the terrorism of Hamas and Hezbollah. It remains a powerful reason why boycotts against Israel deserve to fail.